Minford’s Luke Lindamood and Reid Shultz mob Elijah Vogelsong-Lewis after the latter shot a game-winning base hit into the outfield. Wheelersburg’s Connor Mullins pitches for the Pirates in the seventh inning. Mullins was strong at the plate, going 4-for-4 with three doubles and two runs scored on the day. MINFORD — Teams who don’t quit regardless of the circumstance will always come out better for the wear in the end. For the past 13 years, that’s how the Wheelersburg Pirates’ baseball program has been able to claim SOC II Championships in the sport of baseball — and become the statewide power that it is known as today. 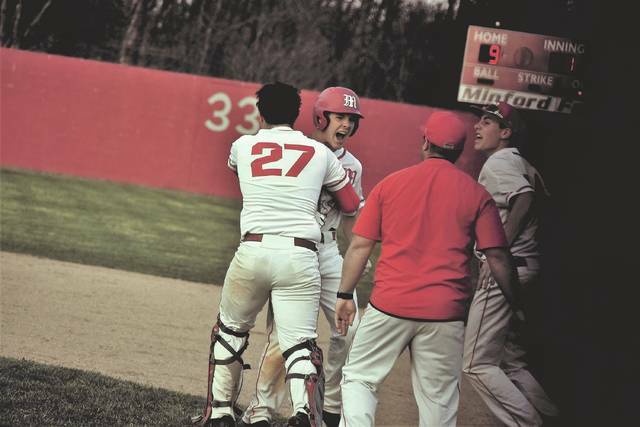 On Friday evening, however, the Minford Falcons’ baseball program showed that Wheelersburg isn’t the only program that has a never-say-die attitude. Down by three runs in the fourth inning of play, Minford proceeded to rally back as the Falcons and the Pirates duked it out in another sensational SOC II duel between the pair. And in that duel, it was the youngest player on the field who came up with the biggest hit of the contest. With the score deadlocked at an 8-8 tie, an error and a sacrifice allowed Nathan McCormick to sprint to third base as the potential game-winning run. The nine-hole hitter, Elijah Vogelsong-Lewis, didn’t disappoint the home crowd. His lined shot to left field dropped in front of a diving attempt by Athan Temponeras to send McCormick on home and send the Minford fans into a frenzy as the Falcons claimed a 9-8 victory over the Pirates on Friday evening in a bout to even the season series between the pair as the heated race for the 2018 SOC II crown marches on. For Aaron Hopper, the contest was all about his unit’s refusal to lose. As for Michael Estep, the veteran leader of the Pirates believed that the energy that Minford displayed, and their willingness to continue to fight — much like Wheelersburg has done throughout its special run — was a critical component in the overall result. From the outset, both teams proved to be up to the task at the plate. Wheelersburg’s Cole Dyer, again, continued his massive hot streak as the senior belted a solo shot with two outs in the top of the first inning to put the Pirates up by a 1-0 count, but Minford immediately countered with two runs of its own in the bottom half of the opening inning. A walk and a stolen base by Brayden Davis allowed Darius Jordan to drive in the former to tie the score. 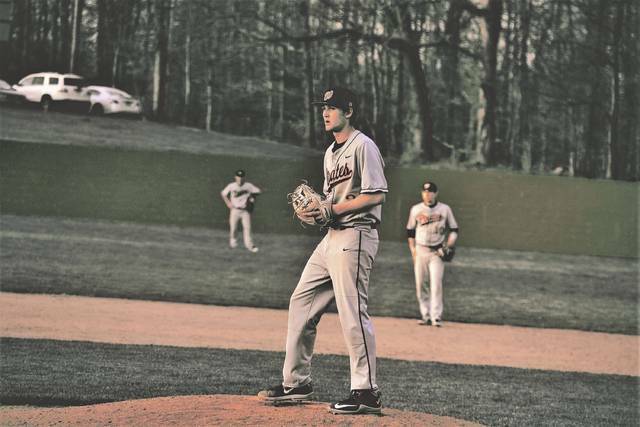 Jordan was caught on a baserunning error, but a drawn walk by Luke Lindamood was followed by a two-out triple by Reid Shultz as the Falcons jumped out in front after an inning of play. Wheelersburg, however, came right back with a big surge of momentum. A leadoff double in the top of the second by Connor Mullins allowed Temponeras to bring in the former with his RBI single as Wheelersburg tied the score at two apiece after two innings of work. When Minford answered back with an RBI single from Lindamood to score Jordan, and retake the lead by a 3-2 margin, after three innings of play, the Pirates countered with two runs apiece in the fourth and fifth to spearheaded the contest’s fourth lead change — with Mullins and Temponeras continuing to do the primary damage. Another leadoff double by the former allowed the latter to score Mullins with a second double to the outfield, and, after a sacrifice bunt by Jaydren Guthrie, Jarrett Stamper followed with a productive one-out sacrifice fly to the outfield to score Temponeras. One-out base hits from Jalen Miller, Dyer, Xander Carmichael, and Mullins all followed in the fifth as Wheelersburg took a 6-3 lead heading into the bottom of the fifth inning. And that’s because Minford never let up from an intensity standpoint. With one out in the bottom of the fifth inning, Jordan again got things rolling from the two-hole by notching a base knock, then stealing a base, which allowed the ever-productive Lindamood to drive the speedster in with a double to the outfield. Two batters later, Shultz followed with another productive at bat as the utility player singled home Lindamood to bring Minford within a 6-5 tally as the trio — who combined to go 7-for-12 at the dish with two doubles, a triple, seven RBI, and four runs scored — spearheaded the Falcons’ assault. The offensive explosion on the home side, however, was just beginning. After a leadoff walk by Bailey Rowe and a single by Vogelsong-Lewis, Brayden Davis came up huge at the top of the order by notching a single to score Rowe to knot the score again at six. That was followed by an even larger base hit from Darius, who immediately followed Davis’ efforts by punching his own double into the outfield to score Vogelsong-Lewis and Davis to give the Falcons the lead back as Minford scored five unanswered runs in a thrilling fashion en route to grabbing an 8-5 advantage after six innings of work. And that, according to Hopper, was all about the confidence that Minford had going into the game due to its own work and preparation. And with Minford hitting the ball as well as it has been, those walks to Davis and Lindamood in the first inning, along with Jordan in the third frame and Rowe in the sixth, proved to be a big factor, as well. In the top of the seventh inning, Wheelersburg, as they have done many times before, battled back once again. Back-to-back singles by Carter and Miller opened the door for Dyer, who seemingly shut it with authority via a three-run home run to put Wheelersburg back in front. There was one problem with that, however — it wasn’t a three-run home run. On his way around the bases following the home run, Dyer — who went 3-for-3 on the day in another strong outing at the plate — missed touching home plate, and was ruled out, which meant that only Carter and Miller scored as Dyer was given a triple. This play ultimately ended up proving to be huge as Bailey Rowe came on in relief after a walk to Carmichael and, after giving up a double to Mullins, shut the door without allowing Carmichael to score from third as the Falcons kept the game deadlocked at eight heading to the bottom of the seventh. And when an error was committed in the infield, along with a sacrifice, Vogelsong-Lewis — who has proven to be poised beyond his years — was able to deliver with that lined shot to left that had players firing out of the dugout to greet McCormick or Vogelsong-Lewis. But it’s the understanding of the roles that each guy plays that has allowed Minford to get the job done. With the victory, Minford improved to 10-1 on the year and 7-1 in SOC II action. The Falcons have another big series upcoming on Monday and Wednesday when the Falcons travel to, and host, Waverly on Monday and Wednesday, respectively — one that could go a long way in deciding the fate of the Falcons, the Pirates, and the Tigers in the SOC II race. As for Wheelersburg, the Pirates, who set with a 5-3 overall mark and a 5-1 record in conference play, will look to rebound against Hillsboro in a doubleheader on Saturday afternoon. It’s a group that will have to show resiliency, as it has done many times before.